Exclusively and entirely available, new and complete house on two levels, 10 minutes walk from the Old Town, the lake and all services. - Wi-fi, parking, bed linen, 1 set of towels for each guest, hairdryer (one for each bathroom), toilet paper, soap, blankets, cushions, hangers for clothes and plenty of other useful equipment for a pleasant and carefree stay. The house is located in a safe neighborhood and not affected by heavy traffic, with the lake, the green of the woods and all the services within a very short time on foot. The air is clean and the area looked after and elegant. The house is well insulated, but has fans for particularly hot days and independent winter heating. At 50 mt. from the bus stop urban transport house, free public parking in addition to the reserved one. My guests have almost always done without the car moving on foot with pleasure, despite the return uphill. Romantic and functional for short stays or longer and relaxing holidays. Elements of furniture from the early twentieth century and modern design accessories cohabit: the first to witness the construction period of the main house and the latter the current period. The house is large and is very enjoyable for a couple as for six people. A special attention is dedicated to the cleaning and care of the details. the double bedroom and the corridor with plenty of wardrobe make the home functional. The equipment of the kitchen includes: dishwasher - fridge / freezer - electric oven - microwave - toaster - coffee and cappuccino machine - coffee pots of various sizes - dishes - glasses and all the necessary accessories and complements. Dining area with table and chairs for six people. Living room: sofa, TV, Wi-fi and reading corner. 1 ° Bathroom with bathtub, w. c., bidet, large sink and hairdryer. Terrace with ornamental plants, aromatic herbs, table, chairs and armchairs. 2nd bathroom with shower, w. c., washing machine, large sink and hairdryer. Closet with ironing board and iron, stendipanni. Free reserved parking (for a car) discovered a few meters from the house in the area closed by an electrically operated bar. Free public parking is available nearby. The whole house and what's in it is totally available to the guests, I just ask that everything is treated with respect. The village has a long panoramic and enjoyable lakeshore, but to the guests I remember that being Lovere a medieval village not situated in a flat area, the old town and the rest of the country have fairly steep streets and staircases. applicable only up to a maximum of 10 consecutive nights. Minors are exempt from paying up to their 13th birthday. This is a beautiful house, set above the lake where there is plenty to see and do. There is a great pizzeria a few minutes walk downhill. The wonderful couple who own the house have thought of everything, with great attention to detail. Really beautiful, spotlessly clean. We would love to return and would certainly recommend to others. Thank you both for a great time! è stato un grande piacere avervi ospitato e conosciuto. 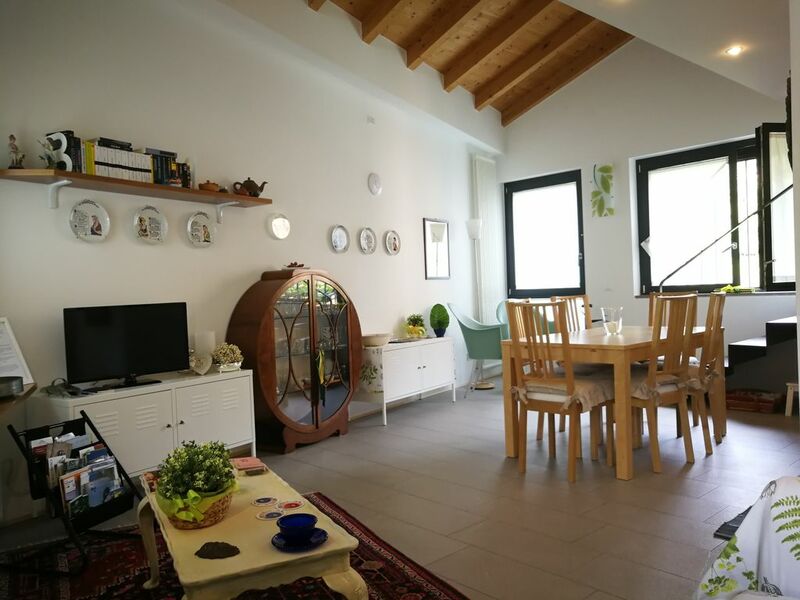 Grazie per il meraviglioso apprezzamento e per avere scelto la nostra casa per le vostre vacanze. Ci auguriamo di potervi rivedere ancora: conserviamo di voi, della vostra gentilezza e dei vostri sorrisi un dolcissimo ricordo. Within a short distance you can find all services: groceries, markets, bakeries, fruit and vegetables, tobacconists, newsagents, bookstores, shops, restaurants, pizzerias, bars, SPAs, pharmacies, churches, post office and hospital, , The bus stop and the Tourist Information Office. On Saturday morning a rich walking market on the lakeshore. Lovere's treasures: the blue of the lake, the green of the surrounding nature, the colors of the works of art, the music of the concerts. Walking, culture, sports and a short distance from the UNESCO World Heritage Site of the UNESCO World Heritage Site. Relax and treat at Terme di Boario or the Terme di Trescore. A few kilometers from Franciacorta with its abbeys, vineyards and its renowned wine cellars. Frivolous shopping days at Outlet Franciacorta or the large Oriocenter shopping mall. Art cities such as Venice, Verona, Bergamo, Milan and Brescia can be easily reached by car or public transport. Pools, rock climbing parlors, canoes, sailboats and motor boats, tennis courts, bike paths and walks along amenous paths with spectacular views.